As the U.S. economy deteriorates, these may become more and more relevant. 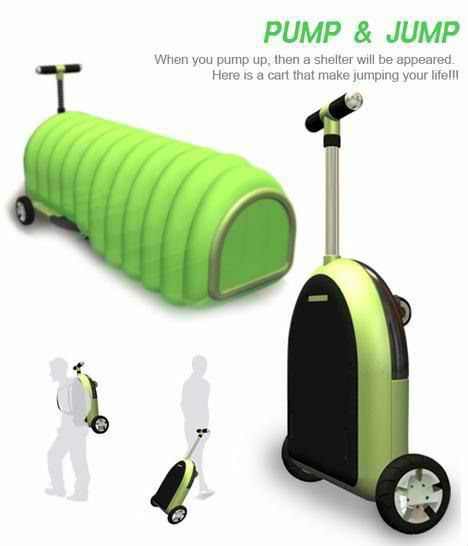 Here are some interesting ideas for homeless folks. City officials spend a lot of time and energy worrying about how to keep homeless people off public furniture and out of certain common areas, when they should be considering how to better manage the issue of homelessness in general. One area of focus is homeless housing, whether simply meeting the immediate needs of people who live on the streets or providing a more long-term, forward-thinking transitional living spaces. These 14 designs for homeless housing provoke thought as to how we can meet the needs of disadvantaged people living in our own communities, and ensure that the situation is only temporary. Homelessness is on the rise, and millions of people across the world do not have a safe, dry place to sleep at night, let alone to perform basic tasks of personal hygiene or prepare themselves for potential employment. The ‘Hopetel’ proposes a transient solution for the waves of newly homeless people who have lost their homes due to foreclosure, providing a stable environment while they attempt to get back on their feet. 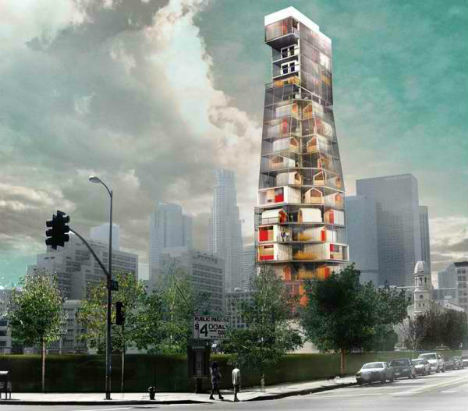 The skyscraper includes compact dwelling units as well as shared amenities like laundry, storage, showers and kitchenfacilities. It’s organized in a way that promotes social interaction between its residents, allowing these people to see that they are not alone. 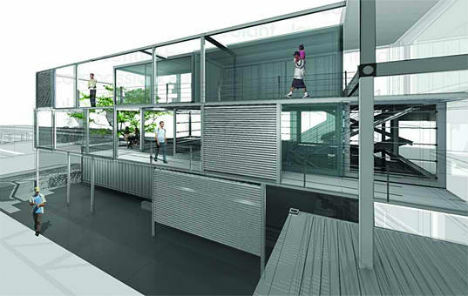 Portable and water-tight, this concept for homeless housing by Paul Elkin could meet the demands of a certain segment of the homeless population that prefers to remain transient. 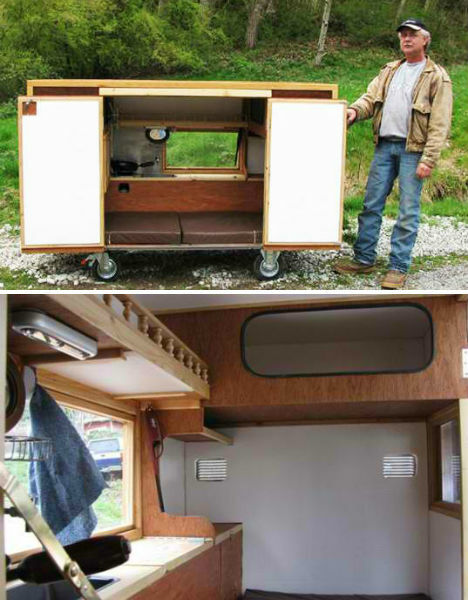 Resembling an extremely compact version of an RV, this low-impact structure contains fold-away furniture, a mattress, a toilet, and even a kitchen. Theoretically it could be built at a very low cost, eliminating the need to sleep out in the open. Portable and temporary, this unusual-looking design by Italian firm Zo-Loft provides a safe storage space for one’s belongings during the day, and expands into a tent at night. The ‘WheelLY’ is made of a rolling aluminum frame fitted with two polyester tents made of recyclable or recycled materials. The rolling design enables it to hold up to 250 pounds of personal items, and the push-handle also functions as a brake. Winner of a competition by Tesseract Collective, ‘Back on Track’ is a comprehensive proposal for homeless rehabilitation that involves not just housing but also community and improving long-term prospects. Going beyond just the requirements for immediate survival, ‘Back on Track’ is designed to be located along a strip of railway in designer Sarah Crowley’s town of Melbourne, Australia. 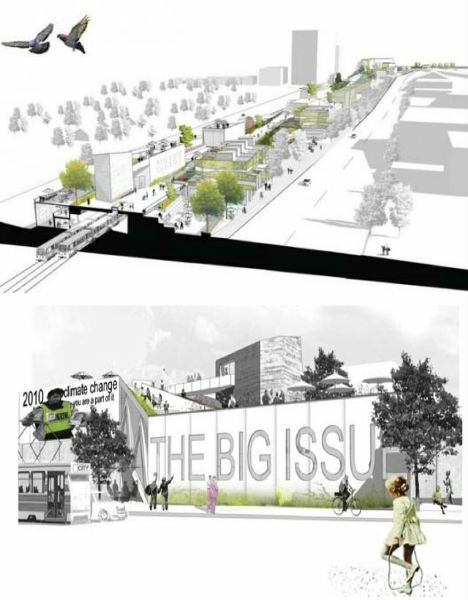 Appropriating an under-used urban space that can be integrated into the surrounding city, the design includes a series of public programs that provide jobs and activities for the ‘formerly homeless’ that would live there. 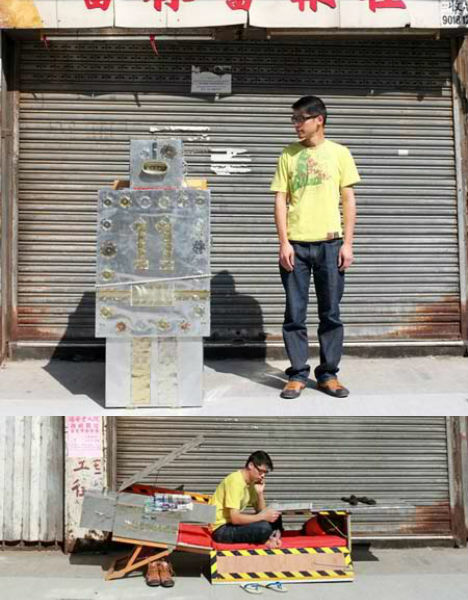 Fanciful, but definitely fun, the Tin Man No.11 design by Kacey Wong takes a less serious look at how portable, wheeled trolleys could provide a safe and relatively comfortable home base for people who live on the streets. “It will not only serve as a shelter for the homeless but also decorate the city street, in a way,” says Wong of the robot-shaped design. The trolley opens to reveal a bed, desk and chair. Wong came up with the design after doing a field study on homeless people in Hong Kong, finding that many people do have jobs, but due to the high cost of living in the city, are forced to live on the streets near their place of employment. 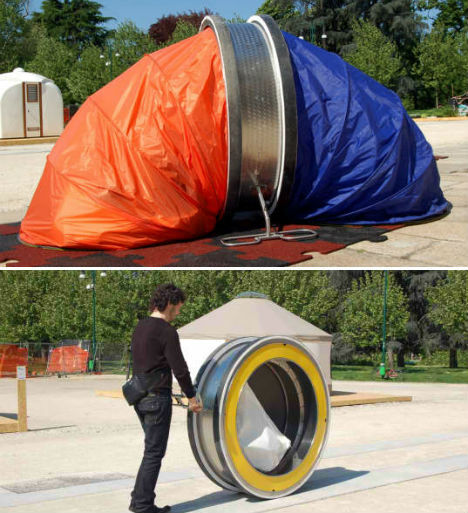 This portable emergency shelter was designed based on the principles of origami. 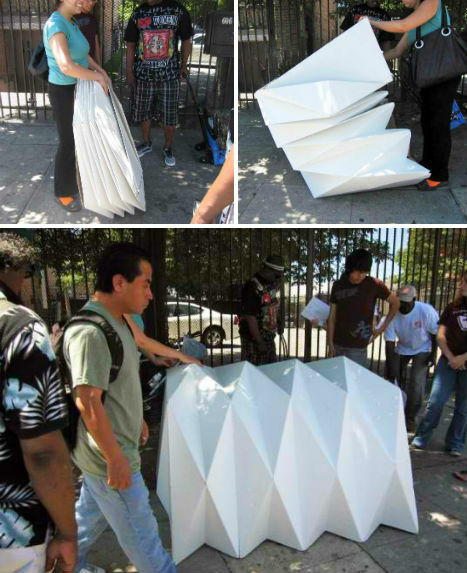 Architect Tina Hovsepian created the Cardborigami shelter from recycled cardboard; it starts out as a flat package and expands into a sort of paper tent. The material was chosen because it is inexpensive, lightweight, sustainable and naturally insulated. Hovsepian plans to refine the design to make it waterproof, fire-retardant and more comfortable. The Sleepbox was actually designed with the intention of providing a compact space to take a nap, in environments like airports, but the design could easily be adapted for homeless housing as well. Russian architects Arch Group envision the Sleepbox as a unit that could be rented for a period of time between fifteen minutes and a few hours, with bedding that would be automatically changed between users; it would be particularly useful for layovers that would normally result in travelers snoozing in uncomfortable chairs. Imagine if these units could be placed in cities, perhaps sponsored by the local community, for people who don’t have roofs over their heads. 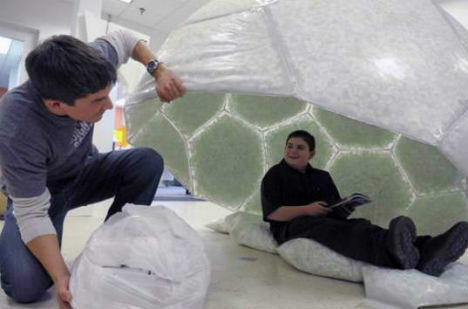 Designed by a 12-year-old boy, the Home Dome makes use of a waste material that happens to provide a lot of insulation from the weather. For his entry in the Design Squad Trash to Treasure competition, Max Wallack won $10,000 and a Dell laptop computer for the structure, which is made of discarded plastic bags filled with styrofoam packing peanuts. Many homeless people gather discarded materials that have value, like aluminum cans, in bags or shopping carts in order to make a little bit of money. 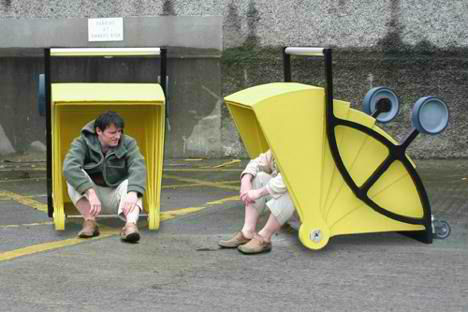 Designers Barry Sheehan and Gregor Timlin re-imagined the potential uses of that cart, creating a large, highly visible yellow push-cart that also functions as a shelter. 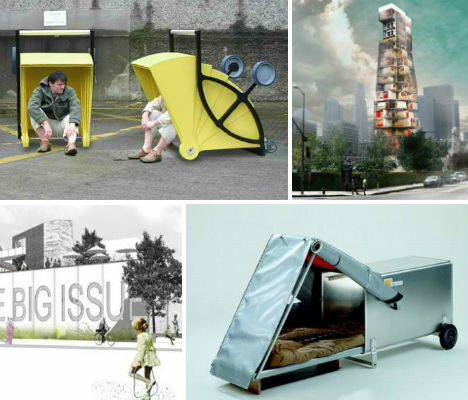 The Shelter Cart – a submission in the 2006 DesignBoom social awareness competition – is not intended as a definitive answer to homelessness, but rather a way to raise awareness about the issue. Tiny mobile homes that can easily be carried around by a single person, these Instant Housing Shelters by Urban Nomads consist of a metal container with a pop-out tent-like structure, fitted with wheels. 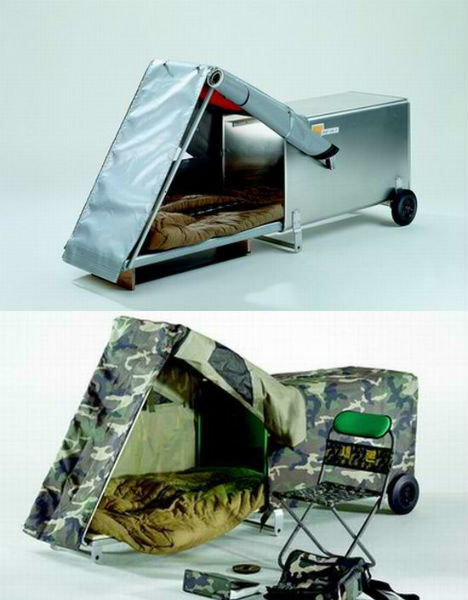 The housing unit contains a retractable padded bed, a first aid kit, mirror, whistle, multi-tool, flashlight and a plastic hood with a viewing window. Affordable and easily transportable, the units could also be used for emergency housing in the event of a disaster, or recreational camping. Homeless people need much more than shelters and even community support – they need health care, too. 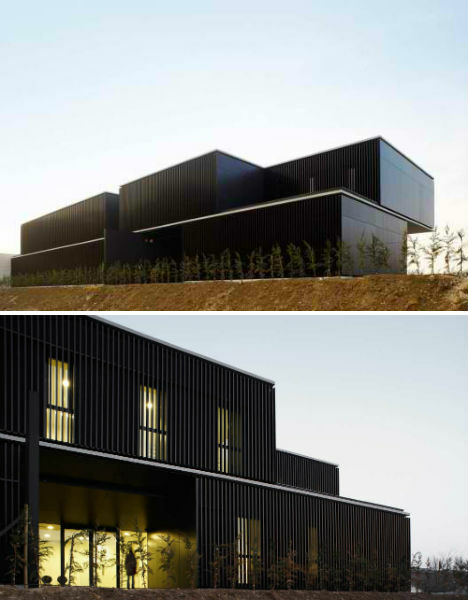 This concept by Co-Tain provides a simple health clinic made of shipping containers. Designed for the Paramore district of downtown Orlando, Florida, the Homeless Health Care Clinic is inexpensive to build, and sustainable. The Shelter Home for the Homeless also considers more than just putting a roof over the heads of people who don’t have one of their own. It aims to improve their quality of life, with a community that emphasizes social interaction. The shared spaces in this sleek design include leisure rooms and spaces for occupational workshops. 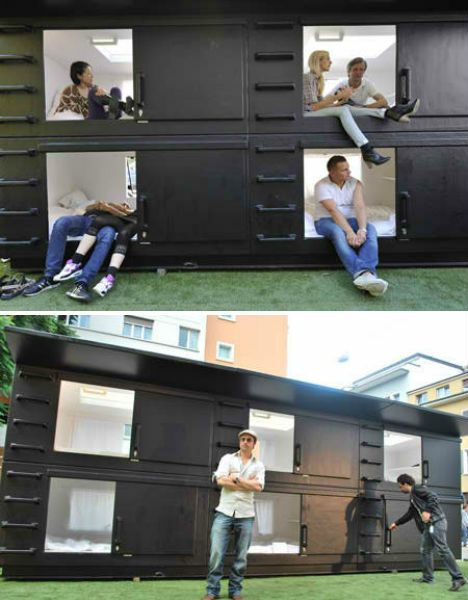 Like the SleepBox, the Mini Capsule Hotel was not designed as a solution for homeless housing, but it could be adapted for such a use. Atelier Van Lieshout created the six-bed dorm-style hotel for an outdoor installation at Design Miami in 2009. Its original purpose, in fact, was almost on the other end of the spectrum: the designers describe it as “a send up of the corporate VIP lounge/oasis” functioning as a place to crash during or after a party. Brad Pitt reportedly bought it for his private beach. 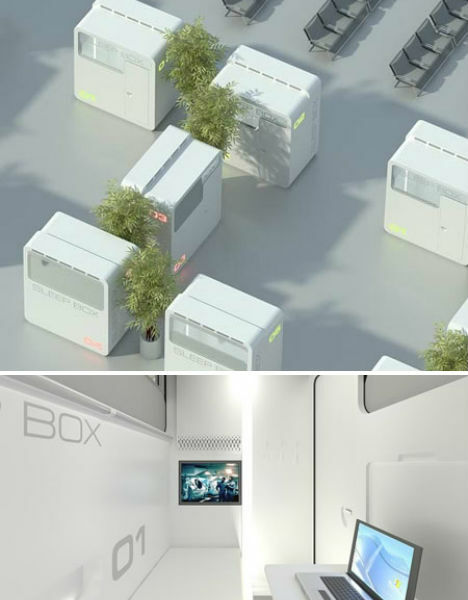 But such capsule hotels could have a much more practical use in urban environments. « Smart Folk Can’t Be Cops?